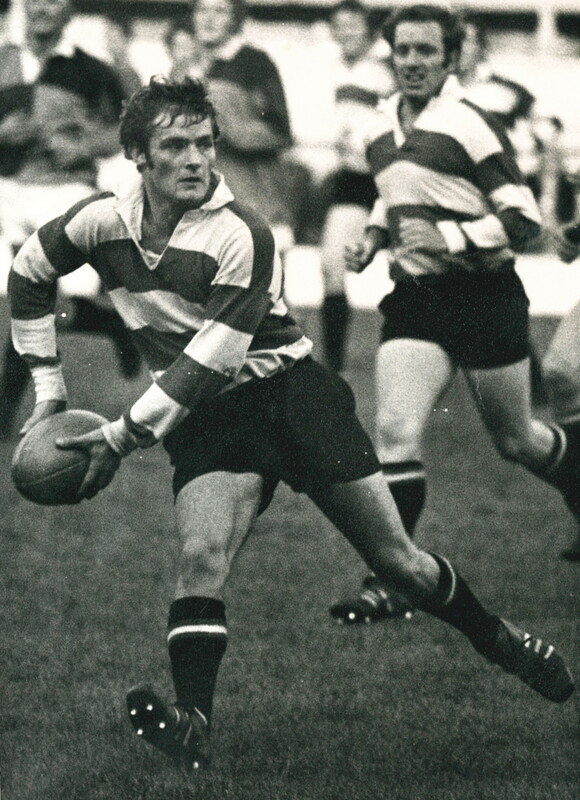 John Dix was a dimunitive but very elusive winger who played 217 games for Gloucester between 1966 and 1977, scoring 87 tries. He played for Gloucester in their victory over Moseley in the first ever club knock-out final in 1972, scoring the opening try, and was the club’s leading try scorer in 1974-75. He was capped six times by Gloucestershire. John’s grandfather, legendary scrum half William “Father” Dix, played 243 games for Gloucester and Gloucestershire before and after WW1. He had England trials in 1919-20-21 and was on the winning side in three consecutive County Champoinship finals. John’s father Bill played only eleven 1st XV games, but scored a hat-trick on his debut against the RAF in 1947. JoinIng John at Kingsholm in 1973, his younger brother Stuart, also a very talented winger, scored the winning try in Gloucestershire’s 13-9 County Championship final victory over Eastern Counties at Kingsholm the following season, but after two years and 33 games with the club, opted to rejoin his twin brother Clive, a centre, at Gordon League. And finally, his cousin Gary Mace, the son of Bill’s sister, made 103 1st XV appearances at half back or centre in the sixties. John played for local club All Blues while still at school, quickly graduating from the Colts to the senior side. He moved up to Gloucester RFC in 1966 and made his first XV debut against Old Merchant Taylors at Kingsholm on Boxing Day, playing right wing alongside his cousin Gary at left centre and scoring his first try for the club. He played regularly on the wing for the remainder of that season, a baptism of fire for a nineteen year old in a team beset by injuries. It was not easy for the youngster to establish himself in the Gloucester side, competing with the large physical presence of Nick Foice on one wing and the ever-present reliable veteran John Groves on the other. When Nick Foice returned to Cheltenham, the prolific Bob Clewes burst onto the scene and it was only when Groves moved back to Pontypridd in 1969 that John gained more regular selection. 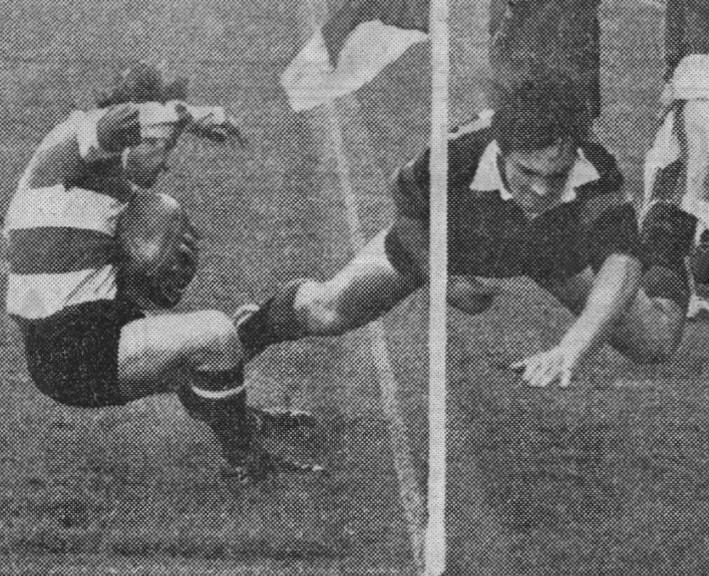 He was in and out of the Gloucester 1st XV for the next two seasons, without ever hitting the headlines, until the inaugural cup campaign of 1971-72. John had been scoring freely for the second XV and came onto the wing for the quarter final, semi-final and final with Eric Stephens dropping back to full back. He played his part in a back line that tackled everything, rounding it off by scoring the opening try in the final against Moseley at Twickenham. The following season he gained a regular 1st XV berth and scored 14 tries in 31 games on the left wing. He made his county debut, playing in pre-championship friendlies against Monmouth and Glamorgan and in the County Championship play-off victory against Devon at Kingsholm which secured Gloucestershire a ¼ final place. However, in 1973-74, with Bob Clewes a fixture on the right wing, he was again competing for the left wing berth with a converted full back, in this case Ron Etheridge in excellent form. John played only 11 1st XV games but contributed 18 tries to a hugely successful season for the 2nd XV in which they won 30 of their 35 games. The following year he played for Gloucestershire against Monmouthshire in a pre-championship friendly and then stood in for the injured Alan Morley in a 9-6 victory over Cornwall at Redruth. Five of his nine tries for Gloucester came in one remarkable game – a 76-6 drubbing of Exeter at Kingsholm in November. With the emergence of Richard Mogg, however, his first team opportunities for Gloucester began to grow limited and he played only eight 1st XV games in 1976-77 and one in 1977-78. Fittingly he scored a try in his last senior game just as he had in his first, although this time the opposition was Cheltenham.